LAS VEGAS, NV — In addition to a number of releases announced today, ASUS ROG (Republic of Gamers) has released a brand new RGB mechanical keyboard and a unique RGB lighting accessory specifically aimed towards gamers. The new Strix Flare from ROG combines a mixture of Cherry MX RGB switches, with funky Auraenabled RGB backlighting and a driver that cloaks the keyboard to stop games blocking your important macros. The Strix Flare is a full-sized mechanical keyboard which will be available in a wide variety of Cherry MX RGB switches including Cherry MX red, blue, black, and brown. The Flare will also be available in one of the latest additions to the Cherry MX line up announced last year, the Cherry MX silver design which features a shorter actuation point of only 1.2mm and a maximum travel distance of 3.4mm; for reference the Cherry MX red switch has a 2mm actuation point and a 4mm total travel distance. 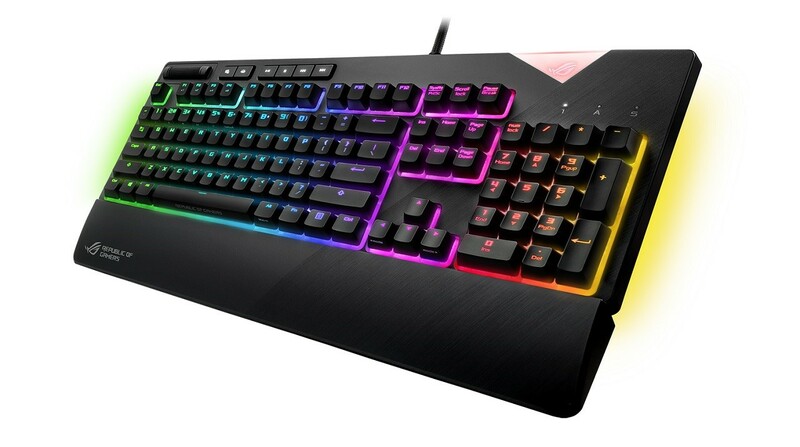 Other features present include N-key rollover, RGB backlighting which can be customized via the ASUS Aura software. Touching more on the RGB, the Strix Flare has up to 13 different lighting effects which include the new raindrop and current patterns, or if you're not a fan of RGB, you can, of course, switch them off completely. In addition to bright RGB switches, the Flare has made the tray bed white to increase the effectiveness of the lighting and has also included nine LEDs along the edges for extra glow, which can all be controlled independently. 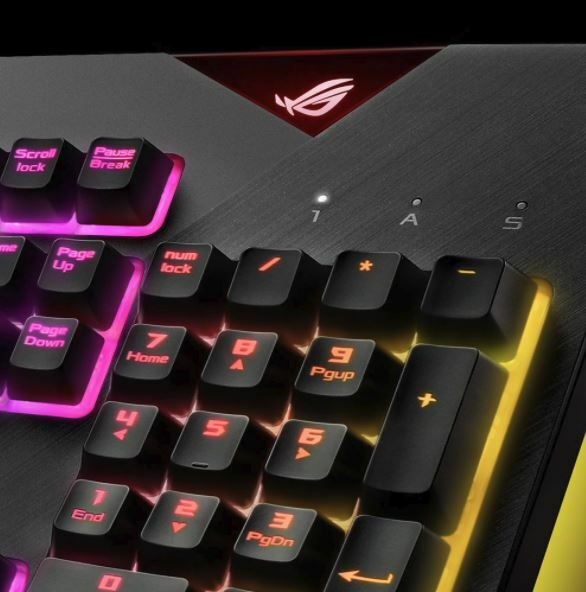 In a twist from conventional keyboard designs, ASUS ROG has placed a set of media controls on the top left-hand side including an aluminum volume wheel. The reasoning behind this is so gamers needn't take their hand off the mouse to make adjustments while gaming, something which will either be appreciated or not. The wrist rest is also detachable if you wish to remove it. 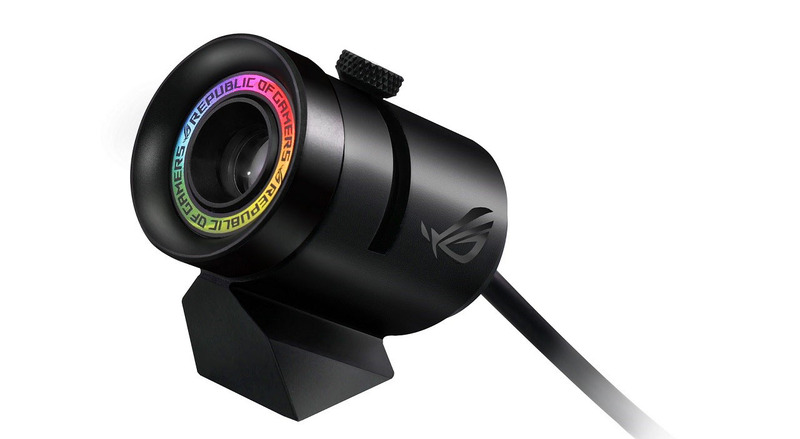 The ROG Spotlight is a unique RGB accessory which allows users to project the ROG logo onto your wall, or surface of choice and can be synced up alongside a plethora of ASUS Aura enabled devices including keyboard, graphics card, motherboard and even monitor; they have to be supported by ASUS Aura Sync, of course, to amalgamate together to create a uniformed regiment of hardware. The Spotlight has a matte-black aluminum finish and features a magnetic base for easy placement onto a metal surface. This new ROG themed accessory also allows for full rotation (360°) meaning placement easy to get the right positioning for you. The ROG Spotlight can also be teamed up with the new ROG Aura Terminal which is essentially a quad channel addressable RGB controller. The new ROG Strix is scheduled to be released in February 2018 with an RRP of $179.99. Pricing and availability of the ROG Spotlight are currently unknown at the time of writing.